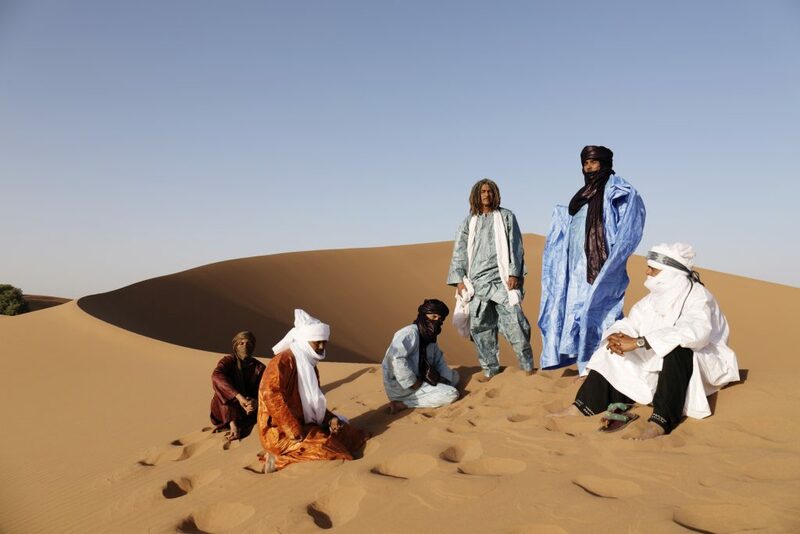 Theatr Mwldan and Cardigan Castle are delighted to welcome Grammy-Award winning Touareg rockers Tinariwen to perform at Cardigan Castle on Saturday 15 July as part of a series of live music concerts taking place over the summer. The Sahara is a place of great hardship and subtle beauty that reveals its secrets slowly and carefully. Its people are resilient and strong, gentle giants among the sand, storms, and sun. Tinariwen come from that place, Touareg nomads from northern Mali, who since forming in 1979 have risen as true rock (and Grammy-winning) rebels, fighting for dignity and self-determination through their hypnotic and electrifying guitar rock that reflects the complex realities of their lives. Tinariwen are the kings and queens of ‘assouf’ (guitar poetry) who have become one of the most successful and exciting African musical exports. Their rolling, yearning grooves and uncompromising messages of simplicity and freedom, distilled over years of struggle, rebellion and exile, have earned them countless accolades and citations, and the attention of high-profile fans such as Robert Plant, Carlos Santana, The Edge and Thom Yorke, and the enduring respect of their own people. Massively influential, incredibly exciting, this is music from the beginning of time to move both your soul and your feet.